What do I do with hummus? Going vegan can be bewildering for many people. You’re discovering all these enticing new foods, and you have no idea what to do with them. In particular, you’re seeing hummus everywhere but have no idea what to do with it. Hummus is a spread or dip made from chickpeas, garlic and tahini that is a mainstay of Middle Eastern and eastern Mediterranean cuisine, and can be used in many different ways. There are countless varieties of hummus, some that are very lemony, some more garlicy, and some that are very spicy. While many people just use it as a dip for chips or bread as an appetizer, you can make some delicious, more elaborate meals from it. A hummus-chickpea-arugula wrap: Just use a tortilla wrap or pita bread and stuff it with hummus, chickpeas, tomatoes, onions, tahini sauce, harissa(Tunisian hot pepper sauce), olives, fresh parsley, lemon juice and black pepper. The hummus is there, it just got buried under all the other ingredients. Not only is this very tangy and delicious, it’s also very nutritious. Not in the mood for a wrap? Another suggestion is to make a hummus platter with stuffed grape leaves(dolma), tomatoes, romaine lettuce, tahini sauce, hot sauce, lemon juice, and black pepper. Another delicious, easy to make(unless you make the dolma from scratch) Middle Eastern meal that’s totally vegan. This barely scratches the surface of all the things you can do with hummus, and Middle Eastern cuisine has so much to offer vegans. Have fun! After that 22 mile run yesterday up to Millwood yesterday, I needed some super-nourishment. So I eventually made my way down to Rye, New York and had an early dinner at Andy’s Pure Foods, which is located in the heart of Rye village on Purchase Street. No, I didn’t run there, I drove. 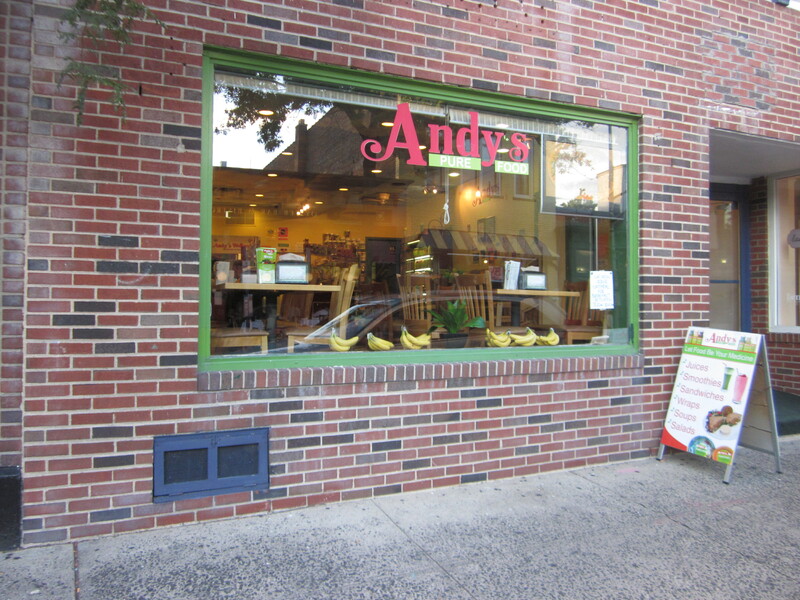 Andy’s Pure Foods specializes in fresh, organic vegan food. They have a very large selection of delicious legume based meals and fresh salads, and sandwiches, as well as fresh juices, smoothies, and even some vegan deserts. They also have many raw vegan meals. 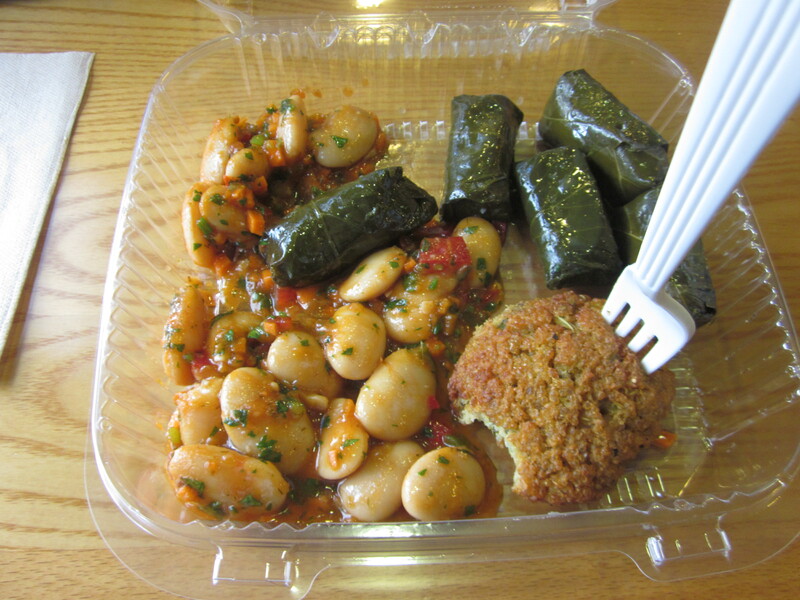 I decided to have the butter beans with dolmades(stuffed grape leaves) and falafel. The dolmades are very fresh and tasty, almost as good as the ones my family makes. The falafel was delicious too. They have a lot of other Middle Eastern vegan food, like hummus, and various chickpea dishes and I can’t even remember the rest. All in all, it was a fantastic recovery meal. I even think I could run today if I really wanted to, but my legs need a rest. I highly recommend Andy’s if you’re in the area. Say goodbye to olive oil? No way! Can house plants improve indoor air quality?